With printed keyrings and coin holders at allbranded, your clients will never be searching for the right currency to use with their trolley ever again! For promotional products to have the most impact on their intended audience, they have to be useful so they are used daily, and be exposed to your business design on a daily basis. As the majority of these items have key rings attached, the recipient can clip their house or office keys to this and carry it around with them all the time. This will ensure your clients will be faced with your business design every time they leave the house! We can offer you premium promotional products which your customers will use daily, one of those being trolley coins. Every time your customer goes food shopping, looking for the right change to use for the trolley can be annoying which is why your promotional product will be used regularly by your clients and produce many brand impressions as a result. Promotional key rings are useful products and will therefore be used by your target audience for many years to come - spreading your advertising campaign effortlessly. Much like custom printed lanyards, these are useful because you can attach your keys to them, making them the perfect promotional tool because it can keep all a person’s important things in one place. Food shopping is such a regular occurrence for consumers that you can be sure your promotional keychain or coin holder will make many brand impressions among your target group. These useful promotional tools will establish a positive memory with your target audience and will also influence others in their environment with your company. This way, new clientele can easily be acquired, and the awareness of your business will increase immensely. Promotional coin containers will arouse interest with your target demographic as well as new potential clients. To achieve that, a visible and eye-catching promotional design is necessary. These items are designed to unlock the trolleys at supermarkets, electronic stores and furniture stores. With their usefulness and versatility, they are one of the best promotional tools to suit all marketing campaigns. A company specific print will personalise this product and make it the perfect small gift. Existing clientele, as well as potential new clients will notice and remember your brand through the right promotional products. Even if you decide to customise with your own artwork the costs will not be more than a few pence per product. Regardless of costs, these promotional items can perfectly represent your company. 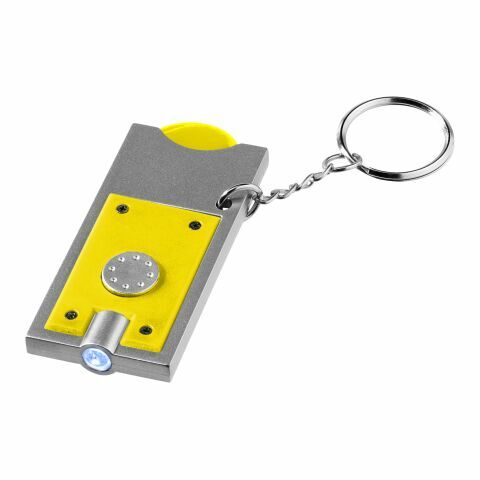 These promotional key rings could be made part of gift bags for your customers and clients, they can be put with our personalised mugs, lanyards, pens and USB drives and given out at exhibitions or events. In order for your promotional products to stand out from your competitors, you have to think outside of the box: these are rarely used as promotional products, which gives them a unique appeal, and will make them very popular among your audience. Choose a modern colour combination and a visible design to help you acquire new customers easily. In order for your promotional lanyards & printed keychains to be eye-catching, you should use a company specific logo or slogan to be printed on the front of these items. Choose a striking colour combination in your design to gain the most impact from onlookers. However, its not just the colour of these items that can be personalised, but also the logo. To achieve this, we work with the pantone matching system (PMS), to be able to offer you the exact colours of your corporate design. It not just the colour that is important, but also their shape. We have many styles of shape, in both metal and plastic materials so there is sure to be a style to suit your business. In this category of promotional products, you will be able to find a variety made out of plastic, but also more premium versions made out of metal. Have a look through the allbranded web shop and choose your promotional key chains and coin containers today!